The widescreen photo from the New Look website. 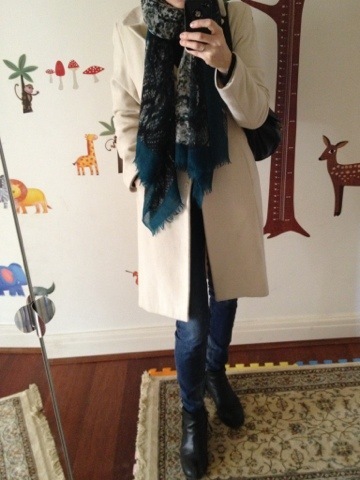 Second: this coat is lightweight, so as soon as the weather warmed up a little, I happily pulled this old friend out. I bought it quite a few years ago in Sydney, when I was young and had lots of child free fun. Ah, the memories… I digress. The rest of the outfit is a Massimo Dutti wool sea green and natural toned snakeskin scarf, Zara super skinny jeans and Kurt Geiger Willow ankle boots. 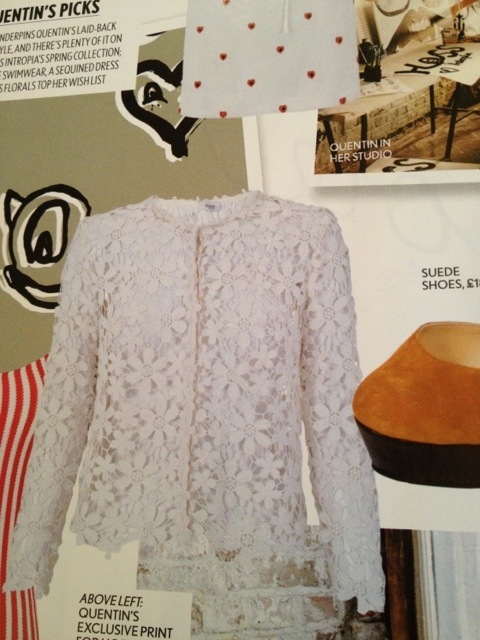 Lastly, while flicking through Vogue today, I saw this charming looking cream lace jacket that will apparently be coming to Hoss Intropia soon. I looked, its not on their website yet, but I’m looking forward to when it is. Its a darling little thing, isn’t it?! This entry was posted in Outfits and tagged Hoss Intropia, Kurt Geiger, Massimo Dutti, New Look, Zara on February 19, 2013 by Belinda WornOut.